Reference number for this case: 9-Oct-54-Macon. Thank you for including this reference number in any correspondence with me regarding this case. Aimé Michel notes that an observation occured on October 9, 1954, in Mâcon in the Saône-et-Loire. He indicates the newspaper Combat of October 12 as source. Luc Chastan indicates in his database that in the Saône et Loire in Macon on October 9, 1954 at an unknown hour, there was an "Observation of a disc of dark color above the Saone (rather seems to be seen from St Laurent)." The website indicates that on 9 October 1954 in Macon, France, there was a sighting. 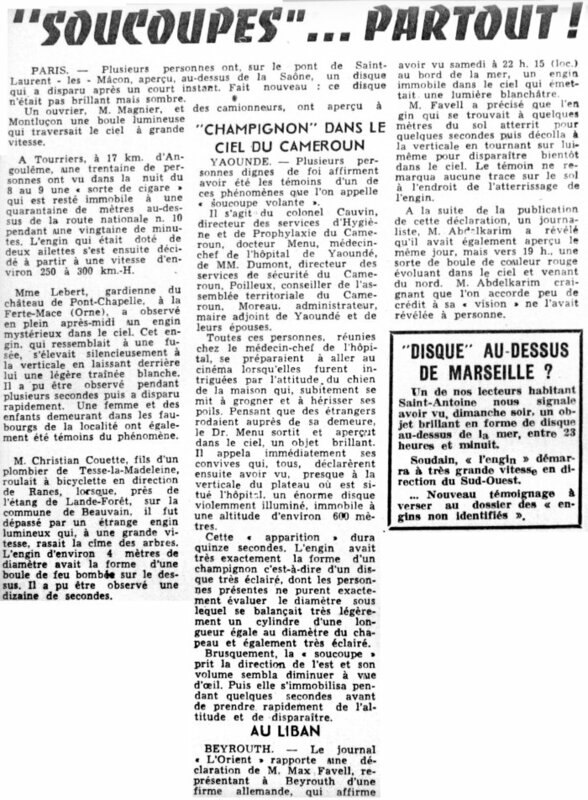 [---] Article in the national newspaper Combat, France, October 12, 1954.